On Monday, I shared a few thoughts I had from Proverbs 31:25 on wise women choosing well made, elegant, modest clothing. As I was reading Proverbs 31 again, I saw that verse 17 also speaks to a woman's clothing. The wise woman (she) clothes herself (girds her loins) in a way that allows her to work, provides security/modesty, and is majestic and praiseworthy (with strength). She keeps her hands busy at work, strengthening her arms. And she is slender. What do you think? Are you dressing with strength? I think I have a lot to work on...starting with that slender part. 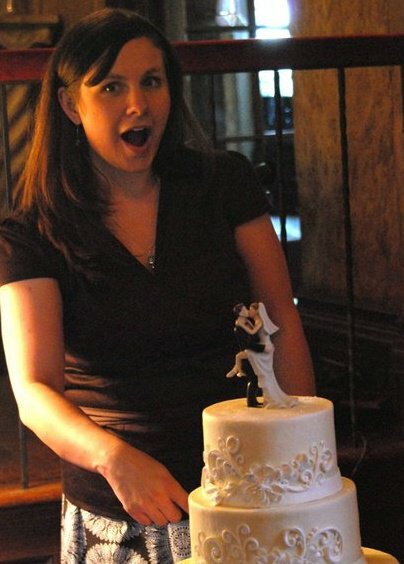 FYI: I didn't really put my finger in my brother's wedding cake. My brother, on the other hand, really did put his finger in my wedding cake. Hehe - LOVE that picture! Never heard ANYONE mention slender with this scripture! I know. I was a bit surprised/convicted when I read that. Although, slender is relative for sure. I think your genes have a lot to do with it.